Kym Maxwell, Collection of found yard materials with labels for the Museum of Anticipation at Dandenong Primary School (Site DPS various locations internal school grounds). Materials: sticks, branches, plastic container, 2018, inkjet print, 30cms x 40cms. Kym Maxwell, Yard Play Day 9, 2018, Dandenong Primary School, Objects of Longing Project. This is field research conducted by the students of Dandenong Primary School, called Objects of Longing exploring the culture of collecting and the economies of play and fantasy during play times at school. This is Creative Learning Partnership with Monash University Museum of Art. Under Development. (Left Wall) A Wharfie's Story Chalkboard Script, 2017. Chalkboard paint, MDF, chalk, screws. 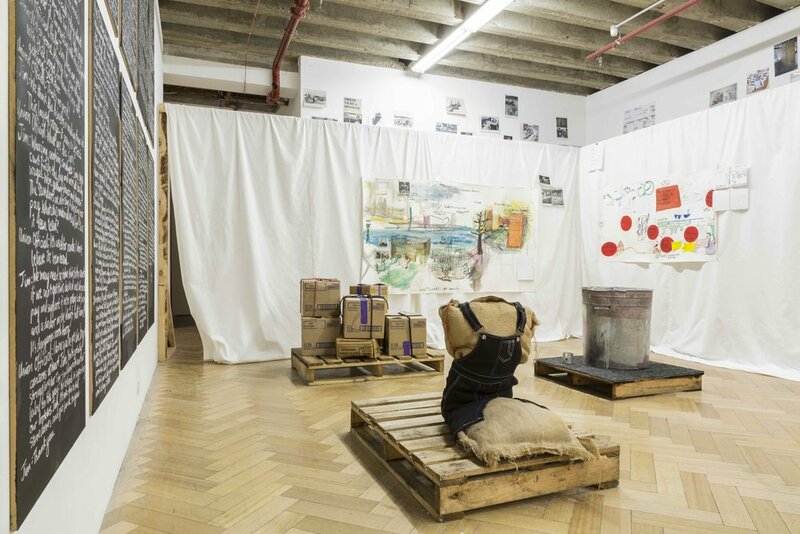 (Foreground Floor) Kym Maxwell, My life as a wharfie learnerar, 2017, hessian sack, and twine wadding and newspaper, purchased girl overall dress, found crate, 810 x 800 x 1010 mm. (Background Floor) Kym Maxwell, 21stC pedagogic process found-material stage design, 1950's Fruit Boxes, 2017, [re-installation instructions: requested seven boxes from Mac Donalds (take those given)], rope, gaffa tape, 'ethics guilt' tubing, glue, newspaper, found palette. Dimensions 1050 x 1100 x 1002 mm. (Right Floor) Kym Maxwell, Swish or Swill, 2017. Found tin can, found tin cup, crate, carpet tiling, water and asbestos like talcum powder, 1200 X 900 X 1200 mm. 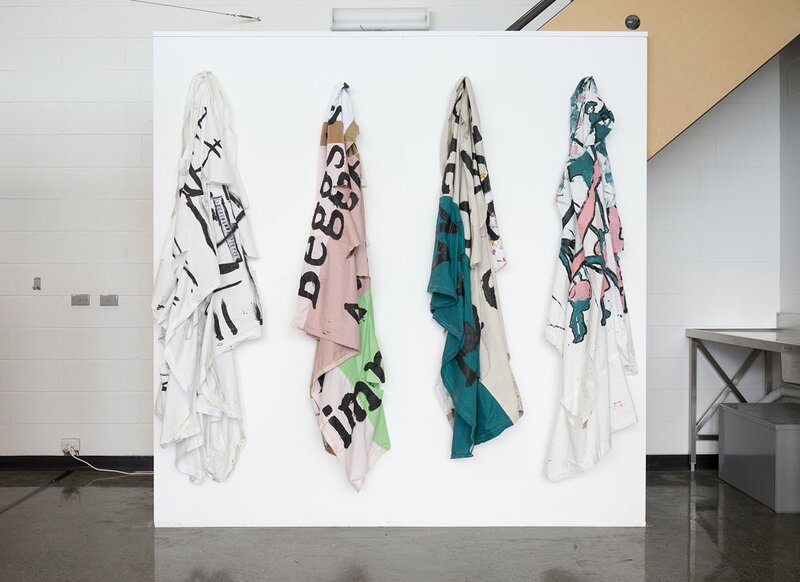 (Back Fabric) Kym Maxwell, The three institutes in watercolour: Monash, The Library at the Docks, Collingwood College, 2016-2017, watercolour, conte, pastel, pen, collage photocopies, watercolour paper, tape. 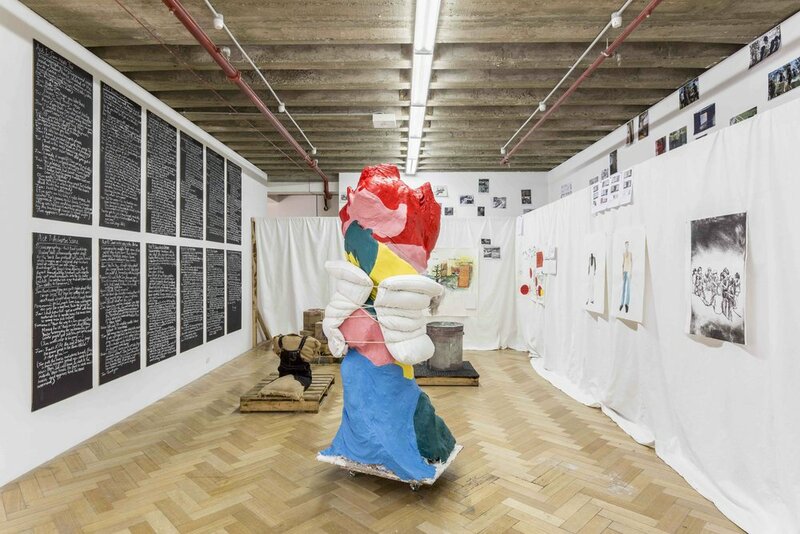 Kym Maxwell, (centre) Education's blood with water viaduct and soft cell stitches, 2017, cardboard tubing, gauze from previous sculpture, backdrop material, plaster, house paint, clear Perspex single filing cabinet, curriculum documentation, rope, cardboard tubing, elastic, pillows, 2050 X 600 X 450mm. Image: Christian Capurro. Kym Maxwell, Learning Labour, (installation view for A Wharfie’s Story), 2017, MFA Grad Show, B.6, Monash University, 2017.Image: Christian Capurro. 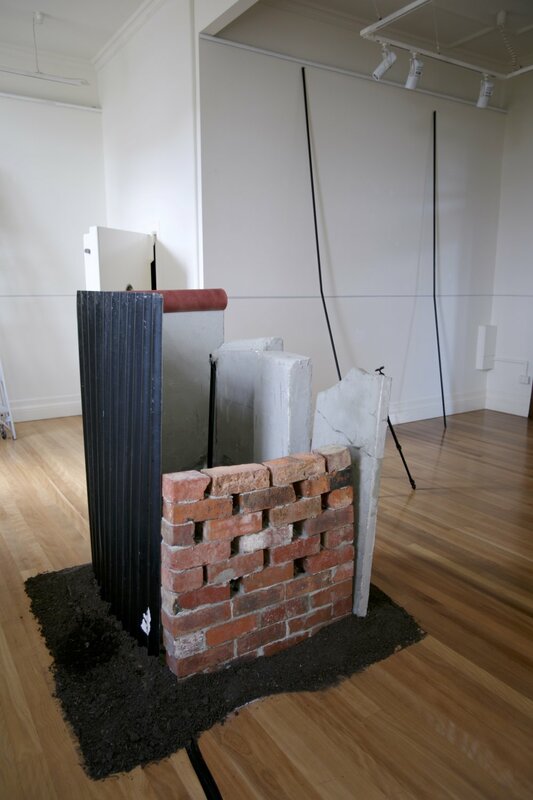 Kym Maxwell, Sets and their institutional setting, (Left) Scene 2: The North Wharf; (Middle) Scene 9: 'Jim Beggs Report to Pier 9 immediately' (Middle) Scene 4,5,6: Waterside Workers Bureau, (Right) Scene 1: Playground (2015), 2017. Cotton, house paint, aluminum frame, Velcro2450 x 40 x2020mm. Installation MFA Grad Show, B.6, Monash University, 2017. Image: Christian Capurro. (Centre Fountain) Kym Maxwell, 2017 A terrible period of policy via psychology (wall totem: Palestine, China, USA, Berlin. Dysfunctional spring - the body geographic in cement, mortar and water), 2017. Cement, water, mortar, metal, plastic, soil, manure, cardboard, paint, glue, foam, pump, electricity, bucket basin, 87cm x 79cm x 150cm. (Walls) Kym Maxwell, Refraction, 2017, Paint, steel, set of 11, 3400mm x 1400mm. Kym Maxwell, maquette, ethic’s guilt, 2016. Plasticine, charcoal, wood, ink, dimensions variable. Maquette, educations’ blood, 2016. Plaster, watercolours, clay, dimensions variable. Maquette, lateral management, 2016, charcoal, plasticine. Image: Christian Capurro. 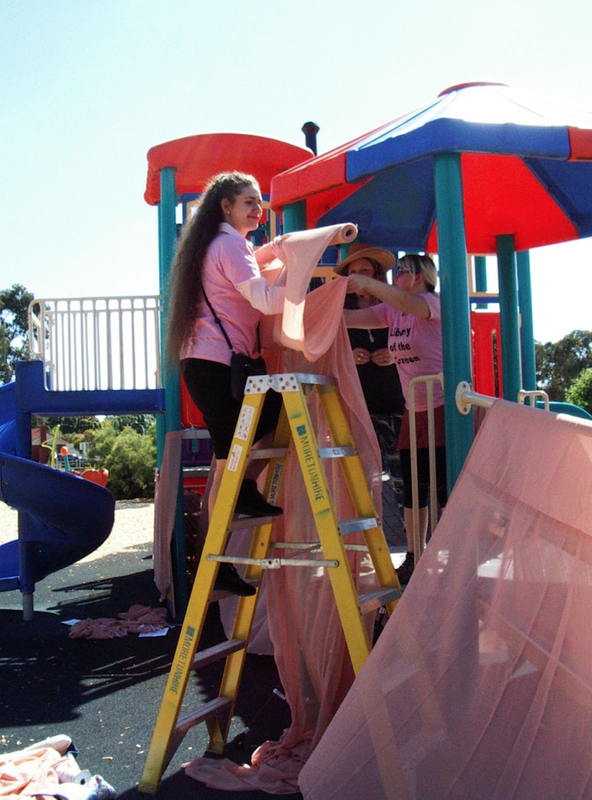 Kym Maxwell playground intervention, Liberty of the Screen, 2014, Malahang Park, Heidelberg Heights, Banyule Public Art Commission with 10 volunteers. chiffon, rope, elastic, chalkboards, screen printed shirts, Dimensions variable. Workshop: A Quiet Act of Disobedience (after Alan Kaprow), 2018, New Student Precinct, Melbourne University for Next Wave. Kym Maxwell, GOODWILL: Memoirs of Yard Play, 2013, wood, toy tyres, rope, bamboo box. Dimensions variable. (Centre Fountain) Kym Maxwell, 2017 A terrible history of Policy via Psychology (totems of Palestine, China, USA, Berlin: dysfunctional spring, the body geographic in cement, mortar and water), 2017. Cement, water, mortar, metal, plastic, soil, manure, cardboard, paint, glue, foam, pump, electricity, bucket basin, 87cm x 79cm x 150cm.